Whether you live far away from your homeland like I do or you still have itchy feet after having a baby, long plane (or train or boat) rides are a necessary evil. But before you start imagining doomsday scenarios that include passengers shouting abuse at you while you desperately try to soothe your wailing baby, rest assured that it won’t be as bad as you think. And don’t forget that flying with a baby isn’t just about getting there. Once you arrive at your destination, you’ll also need to have some tricks up your sleeve to deal with fun stuff like baby jetlag. 1. You must bring MANY forms of entertainment for the trip. My daughter was 10 months old when we flew from Australia to Canada to visit my family. Someone had suggested I buy several new toys and wrap them in shiny, crinkly paper (a toy in itself) for the plane ride. This tip kept Bub occupied for hours and saved our sanity. 2. Bring as many creature comforts as possible. You simply can’t overpack when it comes to favourite blankets, dummies, toys, teddy bears and cosy items of clothing. 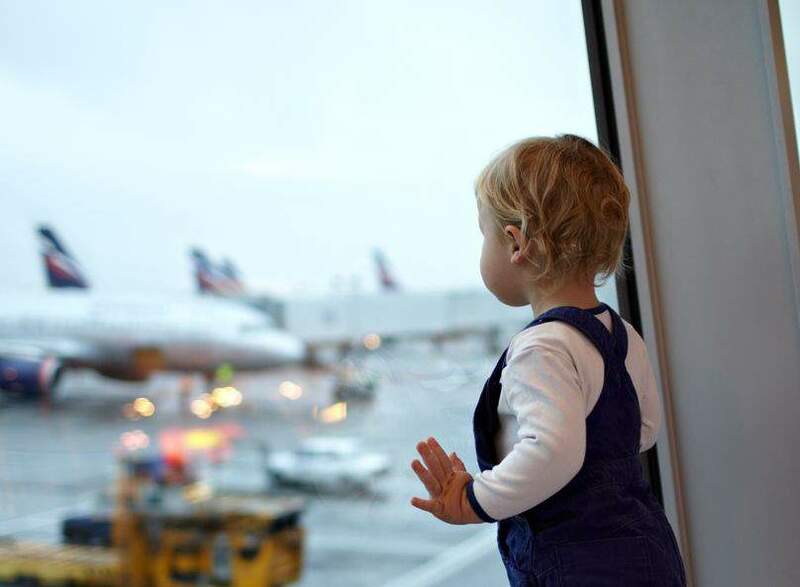 If need be, pack only one outfit for yourself (no-one will notice what you’re wearing anyway because they’ll all be cooing over the baby) and stuff that suitcase full of whatever will remind your little one of home. 3. A white noise machine can help your baby sleep in new environments. My husband and I aren’t really “gadgety” types and we tend to think that a lot of the baby gear out there isn’t really necessary. But our baby has never been the best sleeper, so I started to panic at the idea of 32 sleepless nights during our supposedly relaxing holiday. After doing a ton of online research, I bought a white noise machine. This is basically a device that plays the equivalent of loud radio static to drown out other noises and lull baby to sleep – plus, ours has a clock, room thermometer and night light. I put it on in Bub’s room every night for two weeks before we left, so once we were overseas the sound was already familiar and soothing to her. It helped so much that we continued to use it when we got home. 4. You just have to ride out the jetlag. It took a full week for our daughter to adjust to the 14-hour time difference. My husband and I tag-teamed getting up to play with her in the middle of the night for the first five nights, and then on the sixth I spent two hours rocking and shushing her back to sleep when she wanted to get up. On night seven, she finally slept through. And don’t forget you’ll have to go through the same process on the way back! Of course, if the time difference isn’t as extreme as ours was, it shouldn’t take as long. Previous articleWondering What to Eat When Pregnant? The Answers Here!